Have a question that isn’t covered in the FAQ? The Invicta Customer Service Team is here to help! Feel free to contact them, they have all the answers. To order replacement bands, bracelets and straps, please visit https://invictawatchbands.com If we are currently sold out, please be sure to register your email address for the model and look at compatible options. In order to maintain the integrity of the watch, we do not distribute spare parts. 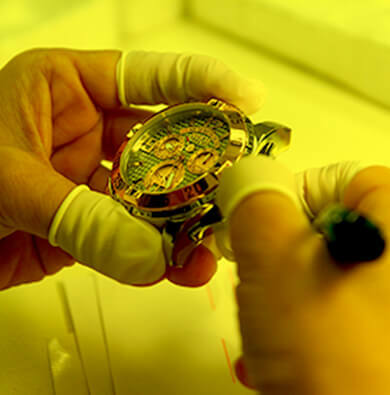 Please send your watch to one of our authorized service centers. Please visit Invictastores.com or our Invicta Run Amazon store. Please take a moment to familiarize yourself with our terms and conditions in order to use the site in a legal manner. Your access to, and use of this site, www.invictawatch.com, www.invictaone.com, www.invictarun.com, www.invictayellow.com, www.activawatch.com, or any other website (each a "Site") owned or provided by Invicta Watch Company of America, Inc., and/or any of its related, affiliated, or subsidiary companies (together "Invicta") is subject to the following terms and conditions enumerated below ("Terms and Conditions") and all applicable laws. By accessing and browsing the Site, you automatically accept, without limitation or qualification, these Terms and Conditions. Please read these important Terms and Conditions below. All content included on this Site, including without limitation, text, graphics, images, animations, computer programs, data, designs, logos and button icons and the arrangement, collection and assembly of same, is the property of Invicta Watch Company of America, Inc. and its content suppliers and protected by United States and international copyright laws. The trademarks, logos, characters and service marks (collectively "Trademarks") displayed on this Site belong to Invicta or are used with permission. Nothing contained on this Site should be construed as granting any license or right to use any Trademark displayed on this Site. Your use/misuse of the Trademarks displayed on this Site, or any other content on this Site, except as provided in these Terms and Conditions, is strictly prohibited. You are also advised that Invicta will aggressively enforce its intellectual property rights to the fullest extent of the law, including criminal prosecution. All material from this Site may not be copied, distributed or republished, displayed, licensed, sold, modified, reused, uploaded, posted or transmitted in any way, without the prior written consent of Invicta except as provided below. You may only download material displayed and identified on the Site as specifically available for downloading and provided you do not delete or change any copyright, trademark or other proprietary notices contained on the materials. Such material is for non-commercial, personal use only. You may not distribute, modify, transmit, reuse repost or use the content of the Site for public or commercial purposes, including text, images, audio and video, without Invicta’s written permission. Modification or use of materials for any other purpose violates our intellectual property rights. Invicta Watch Company of America, Inc. is providing this Site and its contents on an "as is" basis and makes no representations or warranties of any kind, express or implied, as to the operation of this Site or the content, information and materials contained within or accessible through this Site, including without limitation, that they are accurate, complete or current. To the fullest extent permitted by applicable law, Invicta Watch Company of America, Inc. disclaims all warranties, express or implied, including without limitation, implied warranties of merchantability and fitness for a particular purpose. Invicta Watch Company of America, Inc. will not be liable for any damages or any kind arising from the use of or access to this Site, including without limitation, direct, indirect, compensatory, consequential, incidental, special and punitive damages. If you elect to register on our Site and select a user name and password, you are responsible for maintaining the confidentiality of your account and password and for restricting access to your computer, and you agree to accept responsibility for all activities that occur under your account or password. Further, you agree to defend, indemnify and hold harmless Invicta and its affiliates from and against any and all claims, damages, costs and expenses, including attorneys' fees, arising from or related to your use of the Site or any breach by you of these Terms and Conditions. As you navigate through this Site, Invicta will be collecting and tracking personal information, either by asking you to tell us something about yourself or by using data-tracking software which automatically collects and/or tracks information which can include, without limitation, your home server domain name, e-mail address, type of computer and type of web browser you use as well as information concerning what pages you access (individually or collectively, "Information"). Invicta will not knowingly collect information or engage in communications with children. Persons under the age of eighteen (18) are not authorized to use or access this site. Information collected by and communications with Invicta will be used by Invicta for editorial, feedback, marketing, promotional and statistical purposes as well as for product development and site content improvement. Names, postal and e-mail addresses and telephone numbers collected may be added to Invicta's databases and may be used for future calls, mailings and communications regarding site updates, new products and services, promotions, offers and upcoming events. Invicta will not notify you prior to disclosing Information or communications to third parties. The terms and conditions appearing on this page and elsewhere on this site shall be governed by and construed in accordance with the laws of the State of Florida, U.S.A., without regard to conflict of laws provisions. Sole and exclusive jurisdiction for any action or proceeding arising out of or related to these terms and conditions or this site shall be an appropriate state or federal court located in the State of Florida, and your use of and access to this site acts as an express consent to the jurisdiction of such appropriate state or federal court located in the State of Florida. Use of and access to this site is unauthorized in any jurisdiction that does not give full effect to this paragraph. Invicta Watch Company of America, Inc. reserves the right to make changes to this site and to these disclaimers, terms and conditions at any time. Your continued use of this site is conditioned on the terms and conditions stated at the time of your use. You should visit this page prior to using this site to determine the current terms and conditions to which you are bound. This Site is intended for residents of the United States only. Invicta makes no representation that the materials in the Site are appropriate or available for use in other locations. If you access the Site from locations other than the United States, you are responsible for compliance with any applicable local laws. These Terms and Conditions represent the complete agreement between the parties and supersede all prior agreements and representations between them. Headings used in these Terms and Conditions are for reference purposes only and in no way define or limit the scope of the section. If any provision of these Terms and Conditions is held to be unenforceable for any reason, such provision shall be reformed only to the extent necessary to make it enforceable and the other terms of these Terms and Conditions shall remain in full force and effect. The failure of Invicta to act with respect to a breach of these Terms and Conditions by you or others does not constitute a waiver and shall not limit Invicta's rights with respect to such breach or any subsequent breaches. These Terms and Conditions shall be governed by and construed under Florida law without regard to conflicts of law provisions. If you have any questions or concerns about these Terms and Conditions or your dealings with this Site, please Contact Us.